Last edited by Amanda Syme; 09/15/14 04:25 PM. 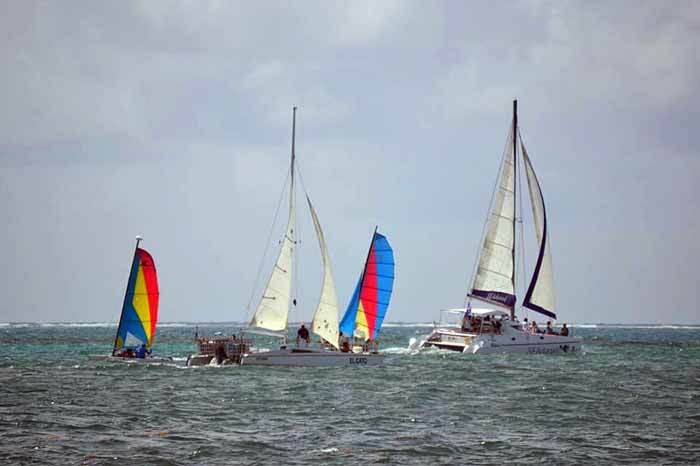 The San Pedro Racers (SPR) will be part of Bart’s Bash, a sailing race that will be simultaneously taking place in several destinations across the world. The event is scheduled to take place on Sunday, September 21st across 65 countries,and is expected to be the biggest sailing race yet. The aim of Bart’s Bash is to set a record in the Guinness Book of World Records, and to be the “Largest sailing event in the world”. 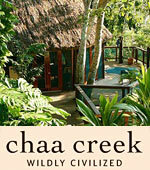 Belize’s venues for the all-day event will be Caribbean Villas Hotel. Bart’s Bash is hosted by the Andrew Simpson Sailing Foundation, a charity organization aimed to inspire the next generation of youth through sailing in the United Kingdom and around the world. 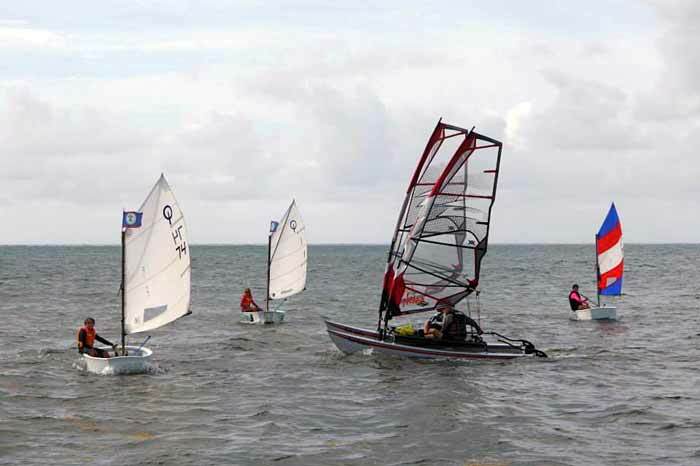 As part of the event, sailing clubs from across the globe will race at their locations. At the end of the race, all sailors will receive an overall world rank according to their score in the race. So far, Bart’s Bash will see the participation of 10,796 sailors from 728 clubs. In addition to attempting to set a world record, the race will also serve as a fundraiser for the Andrew Simpson Sailing Foundation. 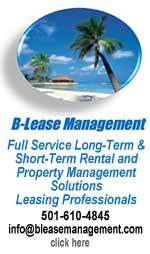 “Sometimes You Can’t Make It on Your Own” – Bart’s Bash in San Pedro, Ambergris Caye, Belize. 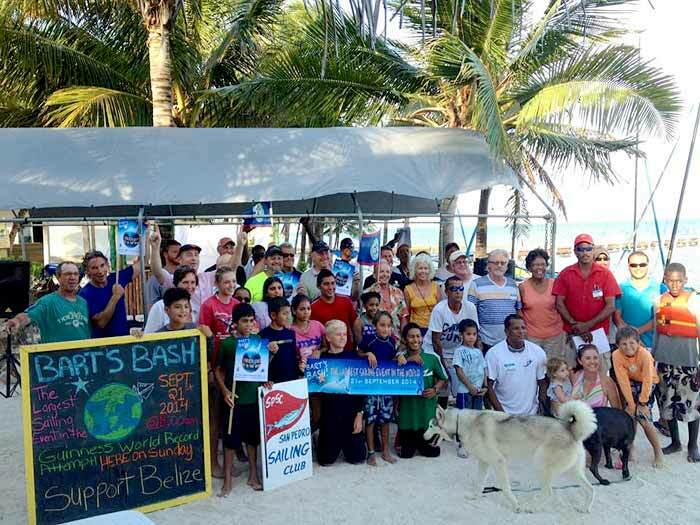 Bart’s Bash, I now know, is a global sailing and fund raising event set up by The Andrew Simpson Sailing Foundation to join together sailors across the world to set a Guinness World Record and, more importantly, raise money for charity. For those of you not aware, Andrew “Bart” (nicknamed after THE Simpsons’ character) Simpson, MBE was an English sailor who won a gold medal for Great Britain in the Star class in the 2008 Beijing Olympics. He was tragically cut down in his prime at only thirty-seven years of age when the catamaran he was training on for the America’s Cup capsized. So what’s this got to do with San Pedro you’re thinking. Well, quite a lot actually because the San Pedro Sailing Club was one of the 754 clubs from 65 countries around the world taking part in this momentous event today. 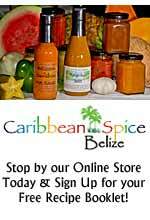 TODAY, September 21st – also coincidentally Belize’s Independence Day – was the first Bart’s Bash. A huge global sailing race and fundraiser in the name of Andrew “Bart” Simpson – a professional sailor who lost his life while sailing in preparation for the America’s Cup. Sailing clubs and teams from around the world, raising money, celebrating sailing and trying to break a Guinness World Record. 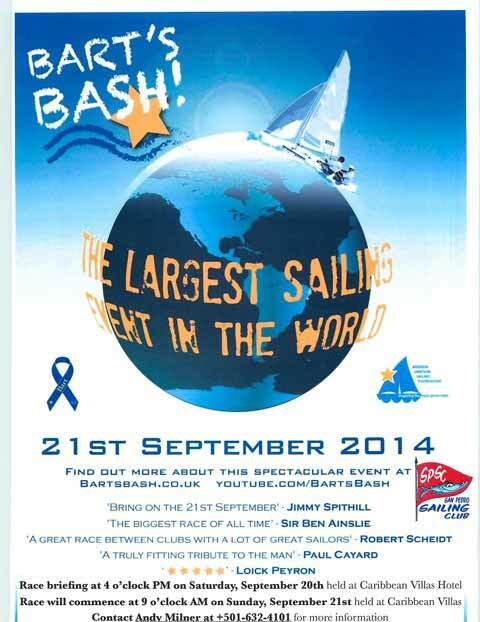 “The Largest Sailing Race in 24 Hours (Multiple Venues)” Guinness World Record attempt. Witnesses, stewards, official videos and photos must be sent. This is the real deal. And the coolest part? One of our clubs here in San Pedro, Belize (don’t even ask why there is more than one)…as well as the clubs in Corozal and Belize City…are participating. The beach before the race. ON BELIZE INDEPENDENCE DAY, 81 SAN PEDRO SAILORS RACED FOR A GUINNESS BOOK WORLD RECORD. 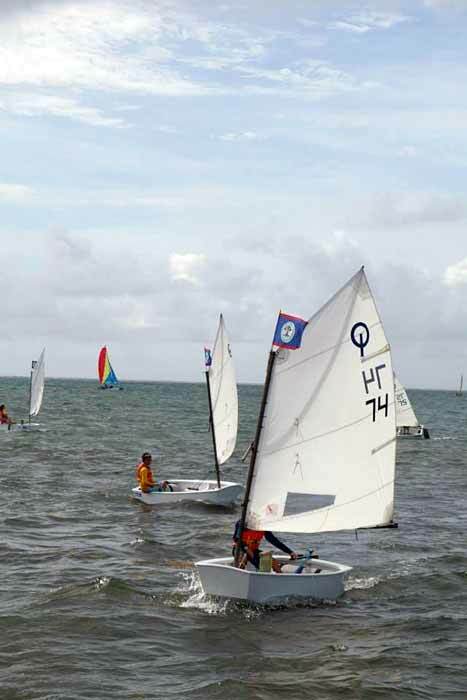 Flying the banner of Commodore Milner's San Pedro Sailing Club (SPSC), 81 sailors manned 28 vessels and competed against 17,500 other sailors of all ages on boats of many classes that hailed from 750 other sailing clubs spread among 65 countries. 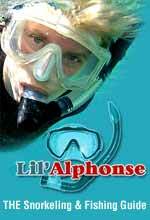 All sailed Bart's-Bash-specified courses on their own home waters. THE SCORING: The Guiness World Record Book's official adjudicators are satisfied that modern computer technology can allow Bart's Bash scorers to control against contamination of results, even with so many potentially confounding variables present - different venues, boat classes, wind speeds, wave conditions, courses, etc. Thus controlled, every boat can be handicapped and ranked fairly against all the others. 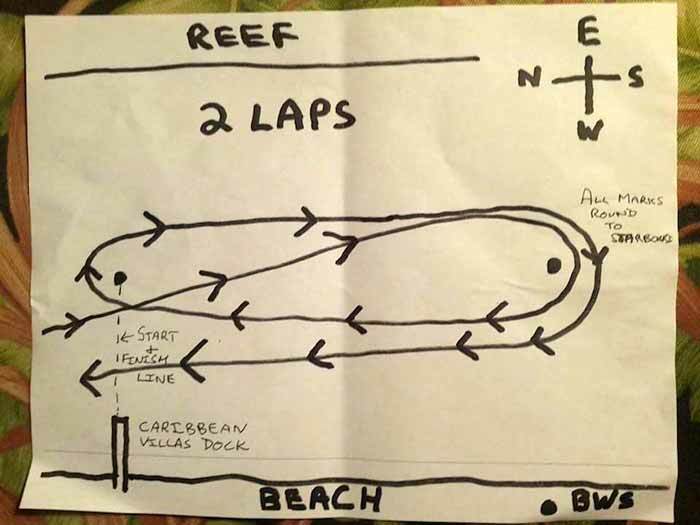 THE RACE: The local course was set in the waters off Caribbean Villas, and crisp 11.3-knot Easterly winds prevailed. HIs Worship the Mayor, Danny Guerrero, replete with air horn was San Pedro Sailing Club's Official Bart's Bash Regatta Starter. Virtually every sailboat on the island that could - big and small - turned out for Bart's Bash. 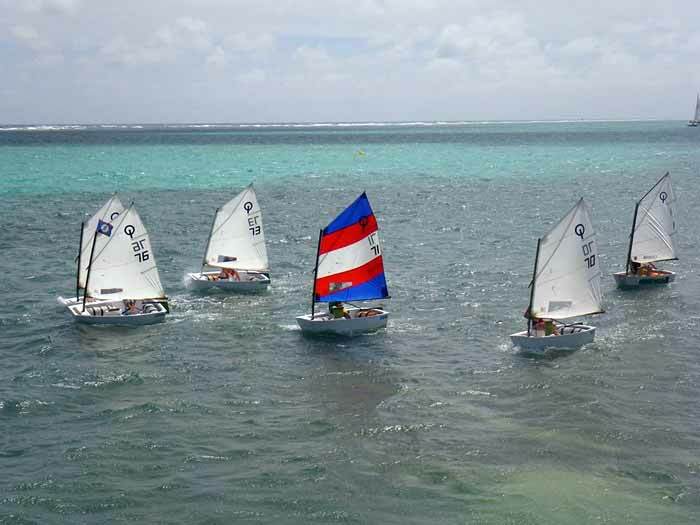 SPSC's fleet of eight little 7-footer Optimist dinghies and 12 -18 ft. Hobie catamarans were joined by Cayo Espanto's and No Worries Tours' Hobies, a Laser, and a 14-ft. custom, 2-masted double hulled twin-sailed experiment. 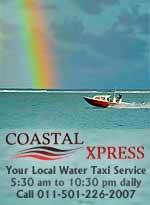 They scudded like water bugs among big charter boats the likes of El Gato, TMM's Avanga, Rum Punch II, Seaduced, Seariious Escape, and Tuff Enough Tours' Just Anada Tuff Day. THE RESULTS - HOLD YOUR BREATH, FOLKS: As of this article's deadline, the scorers have provisional results from SPSC and 131 other clubs. That is about 18% percent of all participants. The scorers expect to have final results sometime today (Friday). Meanwhile, quite a few top honors - at least for the time being and at least among these 132 clubs - appear to go to San Pedro sailors! 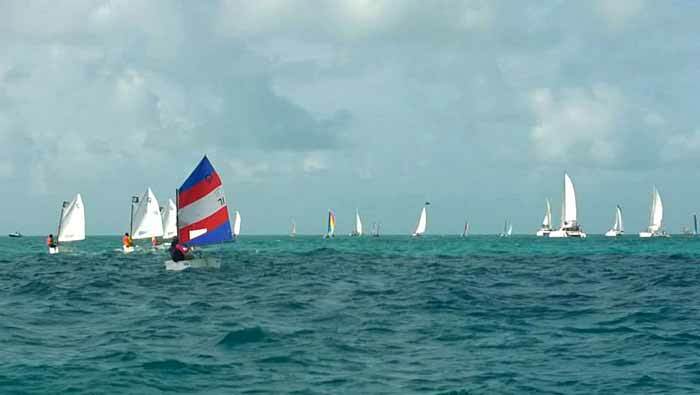 Belizeans are among the TOP SAILORS OVERALL as well as the TOP SAILORS IN MEDIUM WNDS: In both categories, Gorge Oliverez ranks 5th, and Willy Leslie; Andy Milner, and Sarah White are 8th, 9th, and 10th, respectively. Chris Beaumont is in the top 20, with the 18th spot. Joy White and Cindy Vigna are ranked 1st and 6th respectively in the ROOKIE RANKS. Sarah White tops the LADY HELMS, beating her mother Joy who ranks 3rd. 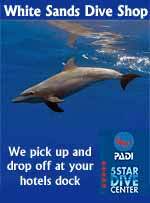 Emails pouring in to SPSC members from around the world express total awe. 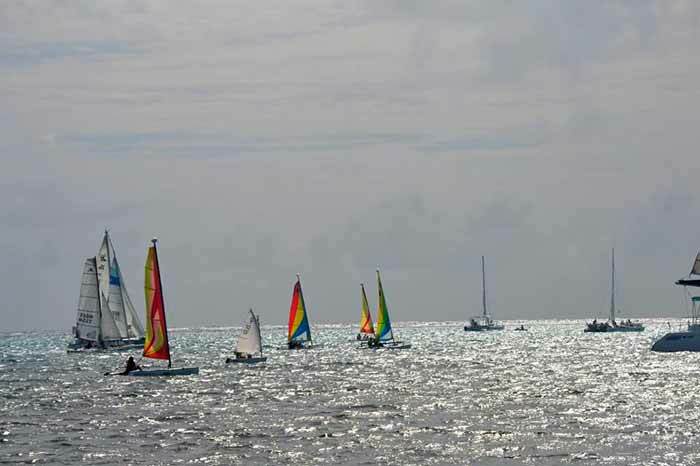 Belize will not only be in the Guinness Book of World Records, respect for Belize as a sailing venue is becoming as broad as it is sudden and unexpected. The Official Time Keepers and Stewards were Callum Syme of San Pedro Weather and Dave and Dr. Rene Reasa, backed up by Isla Bonita Yacht Club manager Beth Hart, and vacationer Lois King. 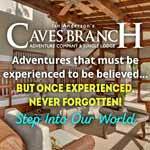 Dr. Rachel Graham of the Mar Alliance NGO and Caye Casa's Julie Babcock served as Official Independent Witnesses, with Dr. Danny Gonzalez backing them up. 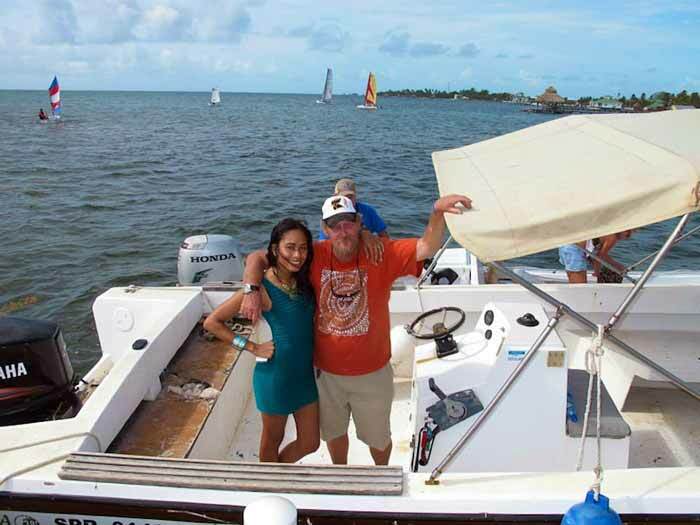 The five safety boats were provided and skippered by Timo Prevett and his 1st mate Alexandra Boiton, Mikey Madrid in Me Boat, Palapa Bar's Scott & Jody Harnish, Peter Lawrence of Pedro's and Caribbean Villas, and Josh Buetttner of Ambergris Seaside Real Estate with his wife, Joanne. Christine Syme ran errands tirelessly for the skippers and race officials, as frequently did Tori Fearneyhough, the Official Video and Still Photographer. Roaming through the fleet with jet ski and GoPro camera was the regatta's Official Action Photographer, Matt Jones. UPCOMING: SPSC will post more highlights of the event on its web site and Facebook page as they come in, and will release the results, analysis and more news to the media as soon as the Bart's Bash Event Managers in the UK makes them official. Once this year's scorers certify Sunday's results, SPSC will present 2014 awards in a ceremony at Caribbean Villas, the exact time and date to be announced. In the true Spirit of Andrew "Bart" Simpson, himself, Bart's Bash UK Event Managers, and all who participated worldwide, some of the awards will be, um, rather unusual, because the first rule of recreational sailing is to Have Fun! 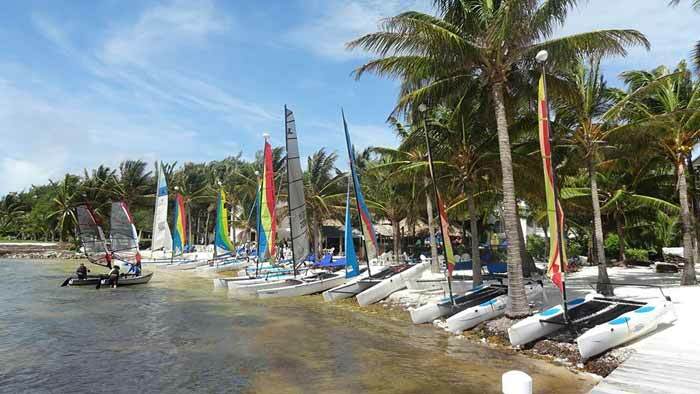 NEWS FLASH: It's Official, The San Pedro Sailing Club will host THE 2015 BART'S BASH REGATTA on Ambergris Caye at Caribbean Villas on Sunday, September 20, 2015. Commodore Milner and crew David Syme. 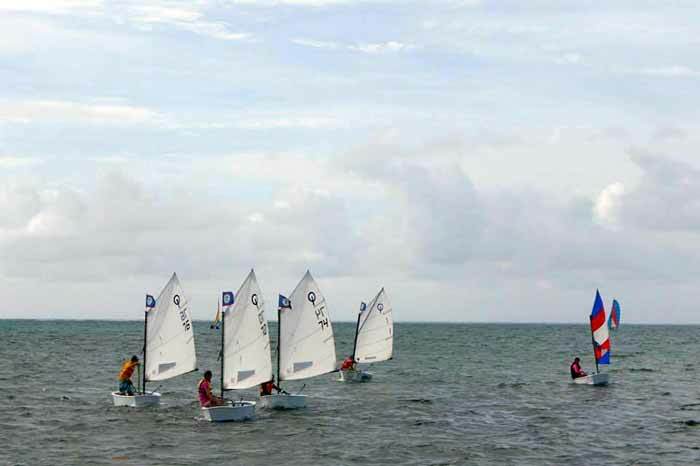 They finished 2nd in Belize and are provisionally ranked 3rd over all internationally in Bart's Bash. Hobies Optimists & Dave Baker's goofy "Twin-surfer." On Sunday September 21st, San Pedro sailors participated in Bart’s Bash, a worldwide sailing race that has officially set the new Guinness World Record for the Largest Sailing Race. The race itself was organized by the Andrew “Bart” Simpson Sailing Foundation. The foundation is a United Kingdom- based charity set up in the Olympic gold medallist’s memory in 2013, and is meant to inspire the next generation of young people through sailing in the UK and around the world. 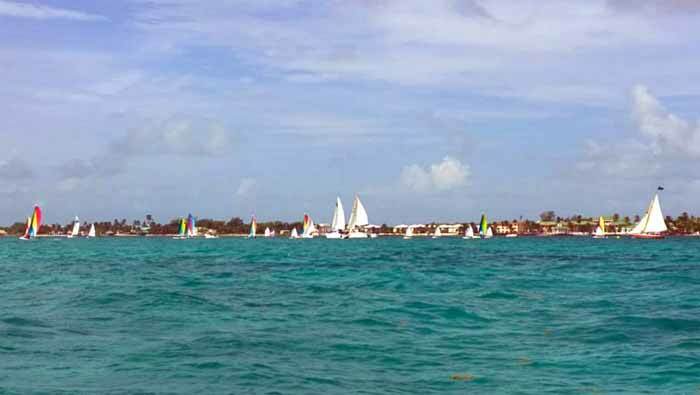 The foundation invited sailing clubs from across the globe to take part in the simultaneous races worldwide, and Ambergris Caye’s very own San Pedro Sailing Club (San Pedro Racers) was delighted to partake. The boats raced two laps from the starting point at Caribbean Villas sailing south along a short course to Victoria House. San Pedro’s sailors joined 17,500 other sailors worldwide, which represented 750 sailing clubs in 65 different countries across the globe. As each sailor crossed the finish line their time was recorded to be submitted to the official Bart’s Bash Website, where they await official tallying. While all sailors will receive official scoring after all global submissions have been averaged by the official website, the day was hardly about competition, as the sailing community gathered simply for the love of the sport. Spectators cheered on the final Optimist sailor as he sailed in and then took the party back to Caribbean Villa’s Beach Bar, where the club and families celebrated the success of a grand event over drinks, brunch and an afternoon barbeque. No one expected it. No one in the world expected Belize sailors all to finish among the top 15%, and place 4 in the top 50, in the biggest regatta of all time. 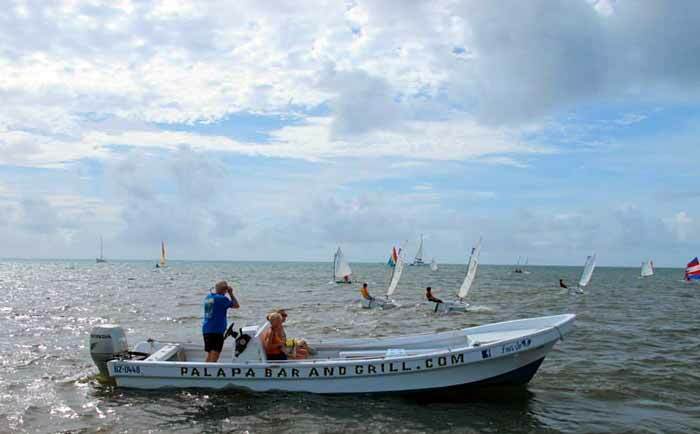 On September 21, 2014, twenty-eight Belizeans were among 16,780 skippers of all ages, all over the world, and in all sorts of sailboats, participating in Bart's Bash, a regatta that the Guinness Book of World Records accepts as the largest regatta in history. It was held in memory of a beloved champion sailor and philanthropist, Andrew "Bart" Simpson and in support of The Andrew Simpson Sailing Foundation. Bart lost his life at age 37, practicing aboard Sweden's 72-foot America's Cup catamaran that cartwheeled in preliminaries on San Francisco Bay on May 8, 2013. The names of all the skippers in this memorial to his life will be recorded in the Guinness book's on line edition. It has taken the regatta's volunteer committee in the UK 5 weeks to compile the results, but they are finally in, and they are something of which all Belize can be immensely proud. 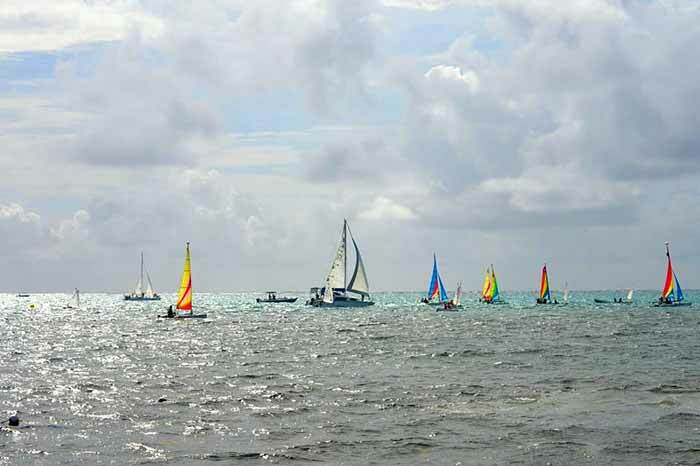 The performance of the Belizean skippers establishes their homeland in the eyes of the international sailing community as a venue for sailors everywhere to admire, to yearn for, and to come and experience. Sarah White, age 14, finished #309 over all, 39th out of all 2,369 lady skippers, 11th among all Optimists, and 6th among the 284 girls sailing Optimists. Chris Lopez, age 13, finished #341 over all, 12th in the Optimist fleet. Kevin Velasquez, age 13, finished #450 over all, 19th in the Optimist fleet of 1179. Alexandra Lausen, age 10, sailed to a 556th place finish over all, an 81st place among all 2,369 lady skippers, a 24th place finish in the Optimist fleet, and a 12th place finish among the 284 girls sailing Optimists. Mitchell Sersland, age 12, finished #668 over all and 27th in the 1179-boat Optimist fleet. Grace Brown, age 13, finished #737 over all, 96th out of 2.369 lady skippers, 30th in the Optimist fleet, and 14th among girls sailing Optimists. Caroline Sersland, age 10, finished #784 over all, 104th out of 2,369 lady skippers, 32nd in the Optimist fleet, and 15th among girls sailing Optimists. Nicolas Lausen, age 9, sailed to a #1258 finish over all which still placed him in the top 8% and 52nd among the Optimist fleet of 1179. 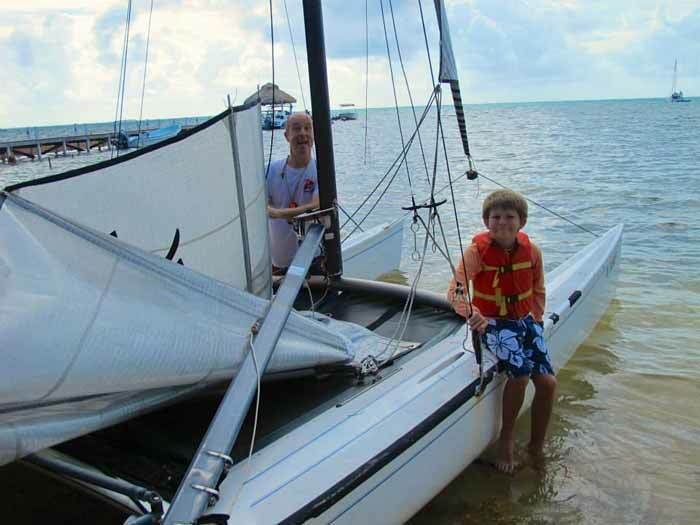 These young skippers truly surprised themselves, their trainers at the San Pedro Sailing Club (SPSC) at Caribbean Villas, and the whole international sailing community. They can be extremely proud of achieving such high international rankings. # 36 - Self-taught Willie Leslie aboard his Nacra 17 catamaran. # 46 - Luis Blanco's younger brother, Jorge Olivarez, an SPSC product, on a Hobe Wave. 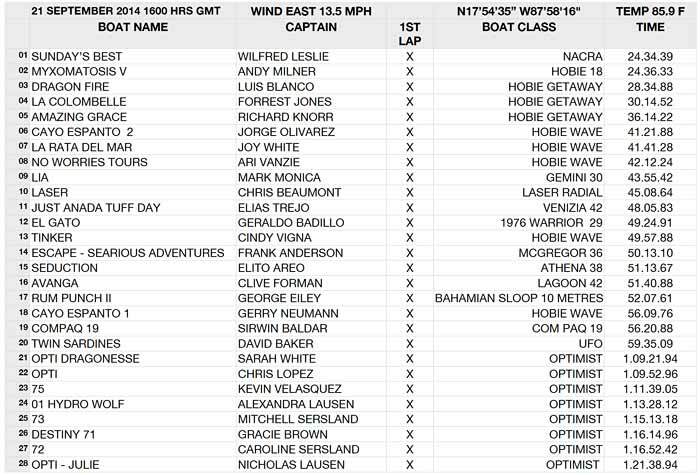 # 51 - Andy Milner, SPSC's Commodore, aboard his Hobie 18 catamaran, placing him 5th out of the 14 others in that class. # 64 - Forrest Jones, SPSC's Vice-Commodore, sailing his Hobie Getaway, came in 2nd, behind Luis Blanco, but the Getaway class had only 2 other entrants. # 201 - Chris Beaumont of the Belize Chocolate Company on his Laser Radial - 8th out of 953 in his class. # 225 - Sarah White's mom, Joy White, SPSC, on a Hobie Wave, placing her 20TH among 2.369 lady skippers. # 262 - Ari Vanzie of No Worries Tours, a Rookie from Cayo Espanto. #1405 - Serwin Baldar, SPSC, on his Com PAC 19 - placed 5th among all 577 sailors for whom this race was their very first. 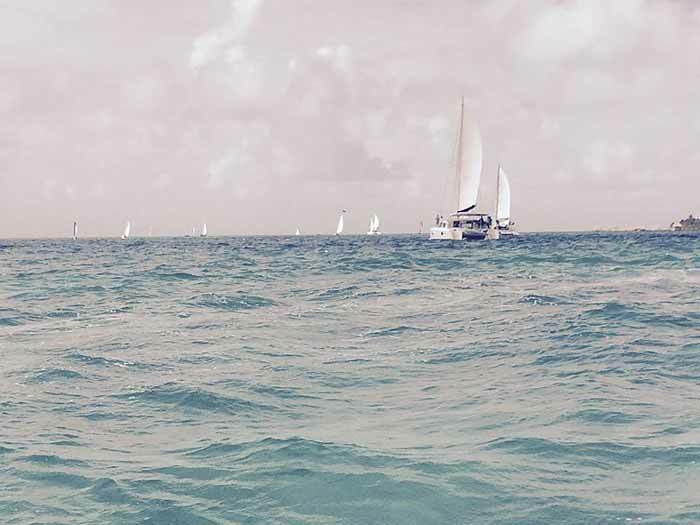 #2498 - Gerry Neuman, on one of Cayo Espanto's waves, is still in the top 15% of all finishers, and placed 12th among those racing for the very first time. 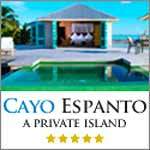 5 - Gerry Neuman, Cayo Espanto. Out of 1498 rookie sailors, Belize's 3 rookies all placed in the top 20. San Pedro's Joy White placed 5th, Venezia Del Caribe Resort & Spa's Richard Knorr placed 10th and San Pedro's Cindy Vigna's #1133 finish placed her 18th among the rookies. 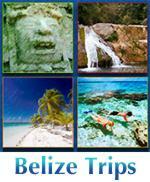 Belize has attracted foreign visitors for many reasons. 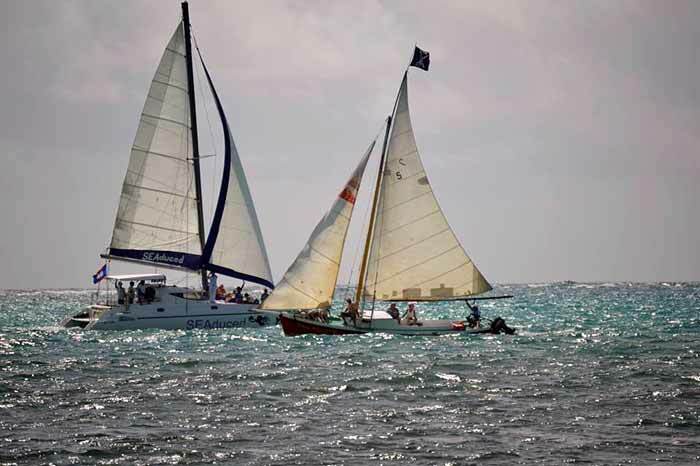 Now, an appeal to the world to come to Belize and sail has been launched by the jaunty Belizean skippers who fared so surprisingly well in the record-setting Bart's Bash regatta.